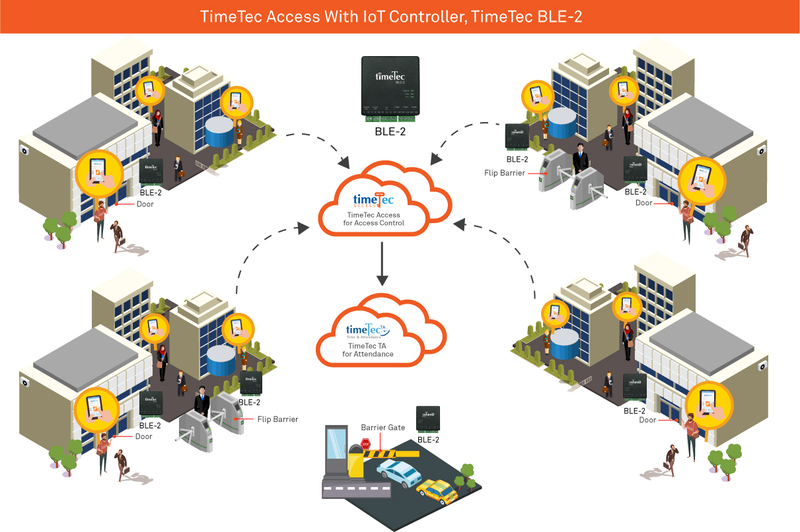 Access control on cloud has finally arrived with the introduction of TimeTec Access and IoT controller, TimeTec BLE-2. This latest access control solution combines cloud technology with Bluetooth Low Energy technology and smartphone application to offer consumers with utmost convenience in door access control. Combination of TimeTec Access and TimeTec BLE-2 let you gain access through your smartphone securely and conveniently. The TimeTec BLE-2 is a bluetooth IoT controller designed to work with a smartphone App to provide door access to users in 2 ways. One user can tap to unlock the door or he or she can choose to scan the QR code to gain access. Any actions taken on the smartphone will trigger the Bluetooth to search for the connected device and perform the unlocking action. Through the App, TimeTec Access, access rights can be authorised by person or by time frame depending on one’s preference. User also can create a temporary access for specific user at a specific time frame for ad hoc tasks such as giving a secretary 10 minutes to enter the office while you are not present to look for some documents. The operation of this solution is so simple; user can enter or exit the door via his/her smartphone App, eliminating the need for physical keys and cards altogether. The TimeTec BLE-2 is suitable not only for doors, it can also be installed at turnstiles and barrier gates, providing user with convenience of using only one system to gain easy access inside an enclave. Manage doors/TimeTec BLE - Determine which devices have been installed at which doors and manage them easily. Manage users on App - Provide access to certain users by linking the devices to the App and centralize access control from one point. Manage access time/rules - Determine the access time and rules applicable to which TimeTec BLE-2 on which door properly. Monitor exits and entries - Through TimeTec Access, data on exits and entries is available for reference. Hence, using one solution TimeTec Access that is available on cloud, all access points can be managed seamlessly and effortlessly. And on point no 6, TimeTec Access data on TimeTec BLE-2 is integratable with TimeTec TA as attendance data, providing users with more values without having to invest on expensive devices for attendance monitoring. Note: TimeTec Access doesn’t come with door sensor to monitor door movements and it can’t be connected to door alarm. For a limited time only, we are offering TimeTec Access at 70% off to our current TimeTec clients for 6 months subscription duration, 50% for newbies who are interested to try this latest access control solution and on top of that, please provide this code [TTTWT2] when when you want to order TimeTec BLE-2. 20% discount applies.